Like the Dingo compact loader rental, the Bobcat MT52 mini loader rental is an incredibly handy piece for equipment that's small enough to fit into cramped spaces, but powerful enough to do a big job once it gets there. Because it's only three feet wide with a bucket, the self-powered, walk-behind MT52 easily can pass through gates, doorways and tight spaces that would stop a larger utility loader rental unit. 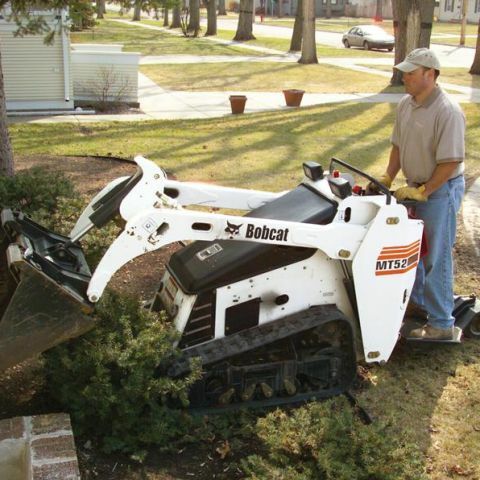 Also, the Bobcat compact loader is easy on the surface, with only 4.7 psi ground pressure. Most commonly outfitted with a bucket attachment rental, the mini Bobcat also has a range of rental attachments including hydraulic auger, forklift and breaker, powered by 12 gpm hydraulic flow. And while it's a good idea to review operating instructions and video, joystick controls for the mini-loader and attachments make it easy to operate.